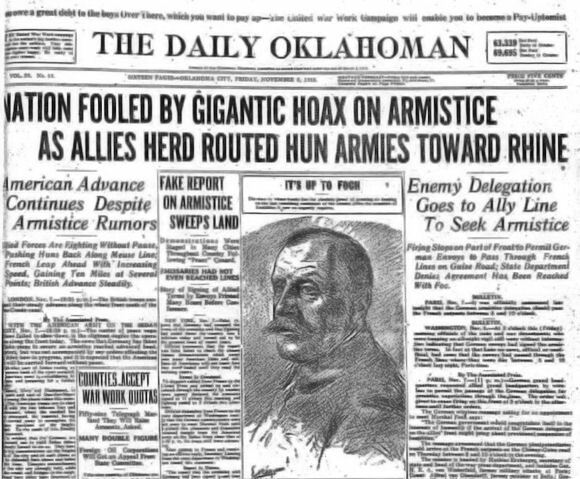 Few recall the premature celebration of victory in World War I, the False Armistice. By Friday, 7 November 1918, the war seemed nearly over, with newspapers reporting Allied advances. At 11:56 that morning, the New York agency of United Press—later known as United Press International—received a cable from France. 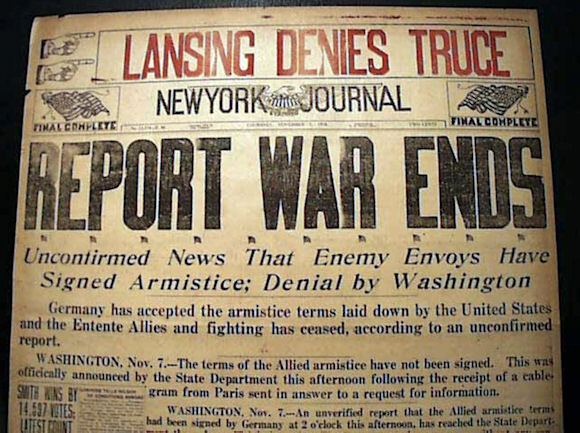 Filed at 11 a.m. Eastern Standard Time, apparently signed by UP's president, Roy Howard, and its foreign editor, William Philip Sims, the message reported that Germany had signed an armistice. This was untrue. According to A.J. Liebling, Howard had lunched with Vice Admiral Henry B. Wilson, commander of the American naval forces in France, on 7 November. 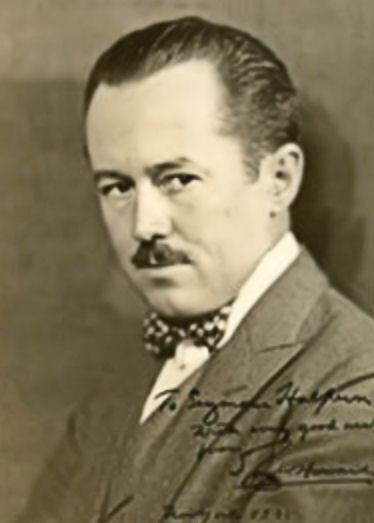 Admiral Wilson told Howard that a friend in the U.S. Embassy had just telephoned him that an armistice had been signed. Under UP procedures, Sims had to approve and sign all cables from France, but Sims was in Paris. Howard was in Brest with, he believed, the scoop of a lifetime. He forged Sims's name and gave the message to the telegraphers who, assuming that Howard was a responsible newspaperman whose cable had been passed by the censors, transmitted it. In turn, UP general manager W.W. Hawkins in New York assumed Sims had seen and approved it. As Liebling observed, if Sims had seen it, Sims might have made Howard confirm his facts. Hawkins submitted the cable to American military censorship, which assumed the story's veracity on the presumption that French military censors must have approved it and passed the cable within three minutes. Then it was released to the UP's subscribing newspapers, which began printing extras: GERMANY GIVES UP, WAR ENDS AT 2 P.M.
Before the papers hit the street, the news was picked up by stockbrokers on the Stock Exchange floor, where trading stopped around 1 p.m. The news spread as fast as telephone lines could carry it. Church bells rang, sirens sounded. At the Equitable Building, 120 Broadway, an anti-aircraft gun on the roof fired blank shells. Judge Learned Hand closed the federal courts, and the state and municipal courts never came back from lunch. Department stores closed. On the doors of Brill Brothers was posted, "Too Happy to Work: Come Tomorrow" and at Rogers Peet "Who can work on a day like this? Gone to celebrate—open tomorrow." The streets were suddenly packed with wildly cheering people. Fifth Avenue was jammed from curb to curb from Washington Square to the Plaza Hotel and people linked arms into enormous snake dances up and down the street. Thousands crowded into St. Patrick's Cathedral, kneeling and weeping with joy as they offered thanks. Up at Carnegie Hall, James Gibbons Huneker, long-time critic for the original New York Sun, was attending a concert of the Boston Symphony Orchestra under Pierre Monteaux. Cheering suddenly exploded outside, and into the hall surged the news that the war was over. There was a shuffling of scores, Monteaux raised his baton, and the BSO burst into the national anthem and "The Marseillaise" as the audience rose to their feet and roared out the lyrics. After that, according to Huneker, Franck's Symphony in D minor and Schumann's Manfred Overture were something of a comedown. At the Knickerbocker Hotel, Broadway and 42nd Street, the enormous crowd in Times Square drew a distinguished guest onto the second floor balcony. He waved an American flag at the crowd, which, recognizing him, began cheering. Then the day's greatest tenor flung back his head, and Enrico Caruso sang "The Star-Spangled Banner." Many later remembered 7 November as a blur of people waving handkerchiefs and flags and total strangers shaking hands and embracing for sheer joy. At the New York Evening Sun, the editors, unable to corroborate the story through their Washington and European reporters, mistrusted the UP's assurances "that there was no doubt of the authenticity of the news." They obtained an official denial of the story from Secretary of State Robert Lansing at 2:15 p.m., but no one in the street wanted to believe it. The UP even alleged that the State Department's information was stale. When the competing Associated Press, unable to confirm the rumor, denied it, an angry mob attacked the AP's offices at 51 Chambers St. In Times Square crowds destroyed copies of the Evening Sun and other newspapers that carried the official denial. The following morning's Times called the UP's cable "the most flagrant and culpable act of public deception" in the history of journalism. The Evening Sun noted with quiet pride that it had not published the false report as fact. Three days later, on 11 November 1918, the Germans really did sign an armistice, effective at 11 a.m., which some still commemorate with two minutes' silence. Howard survived this mistake to become one of the nation's major publishers; he took over the old New York Sun on 4 January 1950. "After that, according to Huneker, Franck's Symphony in D minor and Schumann's Manfred Overture were something of a comedown." heh. Cynicism is composed largely of false news!!! !